This is a die cast scale model of Ferrari 458 Italia produced by Kyosho, one of the biggest name in Japanese toys and hobby segment related to cars. Now, so far and it has been many years now, Honda S200 is my favorite dream car but now for the first time ever I really fall in love with a super car and finally now this Ferrari 458 Italia has become my most favorite dream car of all time though unlike Honda S2000 which in a way still not so impossible to get as long as you have quite a decent amount of money for it, this Ferrari 458 Italia however, will only remain as a dream due to the extremely high price tag and utterly limited to the selected few rich people around. Sometimes that something is so special only because they are unobtainable - says Gilgamesh to Saber in Fate/Zero and Fate/Stay Night anime. 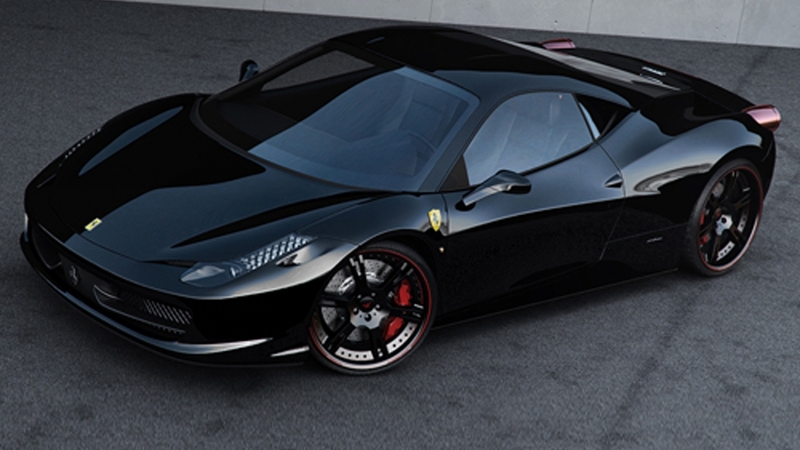 The Ferrari 458 Italia is a mid-engined sports car produced by the Italian sports car manufacturer Ferrari. 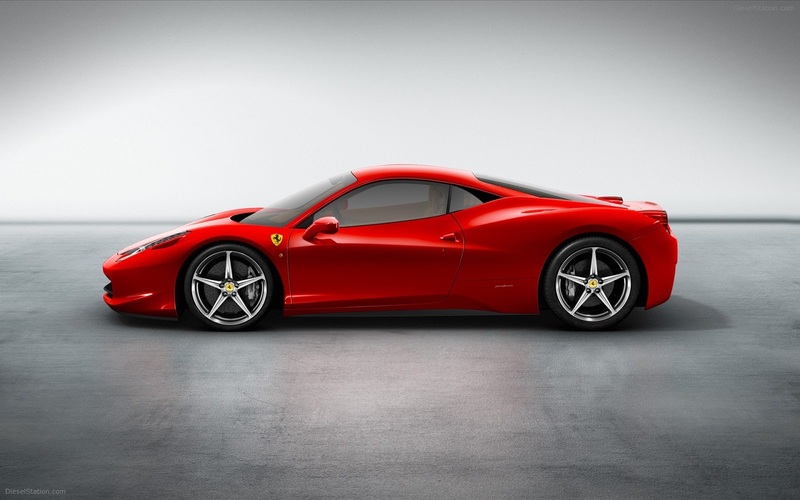 The 458 Italia replaces the Ferrari F430. 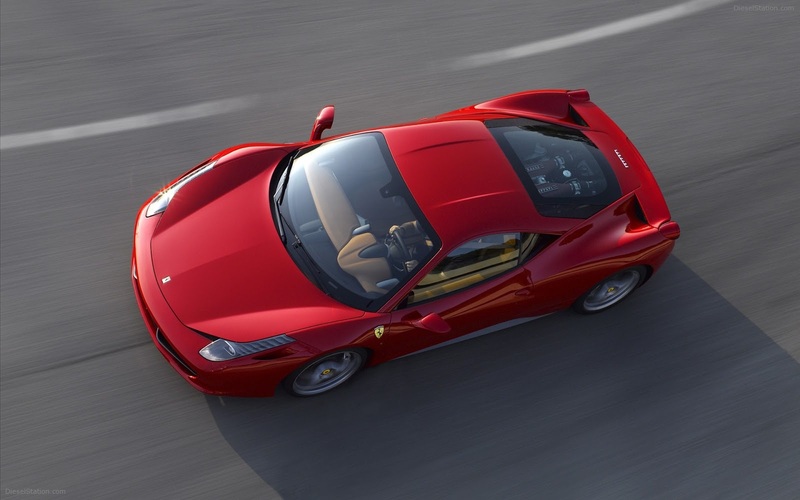 The 458 Italia was officially unveiled at the 2009 Frankfurt Motor Show on 15 September 2009. In Ferrari's first official announcement of the car, the 458 Italia was described as the successor to the F430 but arising from an entirely new design, incorporating technologies developed from the company's experience in Formula 1. 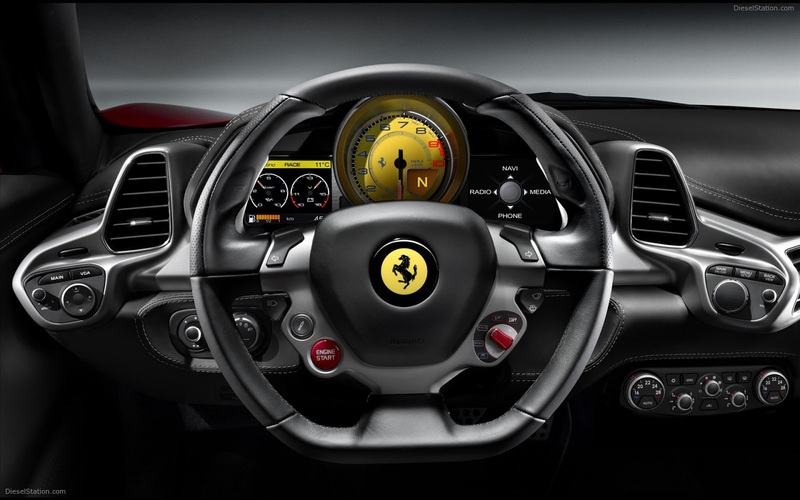 Ferrari's official 0-100 km/h (62 mph) acceleration is under 3.4 seconds, while top speed is 325 km/h (202 mph). It has fuel consumption in combined cycle (ECE+EUDC) of 13.3 L/100 km (21.2 mpg-imp; 17.7 mpg-US) while producing 307g/km of CO2. As with all recent Ferrari models, the body was designed by Pininfarina and the body computer system was developed by Magneti Marelli Automotive Lighting. Nonetheless let's have a look at this exciting die cast car model of Ferrari 458 Italia from Kyosho. Wow that is absolutely awesome!!! This is one of the best detailed interior for such 1/64 scale model. Kyosho really put a whole lot of effort on the interior detailing, the sculpt quality is excellent and even the visible top part of the engine looks pretty mesmerizing. Brilliant, absolutely brilliant!!! Well done Kyosho, this is superbly brilliant. One thing though, if I got this during those days when I still love to do die cast car customization project, I would most likely change the seat color from black to red using spray paint but unfortunately nowadays I no longer want to get my hands dirty doing all those stuff and I think the black color for the seat is not bad at all either. Probably not many will agree with me but I will say it anyway, this car is pretty and I think it is the most prettiest car ever made in the world - at least for now. They are many Ferrari out there, I would described them as wonderful, beautiful, intriguing, modern beauty, classic beauty, brilliant or mesmerizing but this 458 Italia is simply pretty and the prettiest Ferrari of them all. As for the exterior of this scale model, I think Kyosho have done a superbly tremendous job on all aspects we could expect from a typical 1/64 scale model. The casting, painting finishing, logo and marking, exterior detailing on head lamps and tail lamps, wheels design and the rubber tires and not to forget that they also provide side mirror - this is a dream come true, absolutely brilliant. Kyosho give serious attention to each and every aspect when they produced this scale model and the result is just astonishing. Note: I do not claim any rights on the above 4 images with their respected source mentioned. Images are used for information and comparison purpose only. All rights and credits belong to the respective owners. Overall, as a die cast scale model mini car, this is one of the best available now and despite the high local price tag of SGD 20.00 (about USD 15.70 / EUR 11.80 / 1,535 Yen) I am extremely happy with the result produced by Kyosho. Bear in mind the local price in Japan for this model is only 500 Yen though (about SGD 6.50 / USD 5.10 / EUR 3.80) though they are only available in a "blind box concept" but if I really have to pay SGD 20.00 (about USD 15.70 / EUR 11.80 / 1,535 Yen) to get such quality finishing, then by all means, I don't mind. This is absolutely brilliant and that Ferrari 458 Italia is indeed the most prettiest car ever made. It would be better if I could get this model with the red color instead of black but unfortunately the shop's selling this item only have the silver and this black color - the red has long gone (can't blame them on that - this is a very pretty car to be in red). Anyway, between black and silver, I prefer black. Now, I really need to hunt all the other Ferrari 458 Italia out there that comes in red or yellow color, this gonna be a fun adventure for me. And just for fun sake, I also make some sort of side by side comparison to see how this pretty Ferrari 458 Italia if compared to some of my favorite die cast scale models in our collections. The Ferrari 458 Italia side by side with the Tamiya Honda S2000 - the comparison for me is like the pretty (458 Italia) and an average looking Japanese guy (S2000). Last but not least, the 2 powerful cars from Tomica regular line up trying their luck against the pretty Ferrari 458 Italia and for me it's really just a waste of time comparing the adults with the kids.